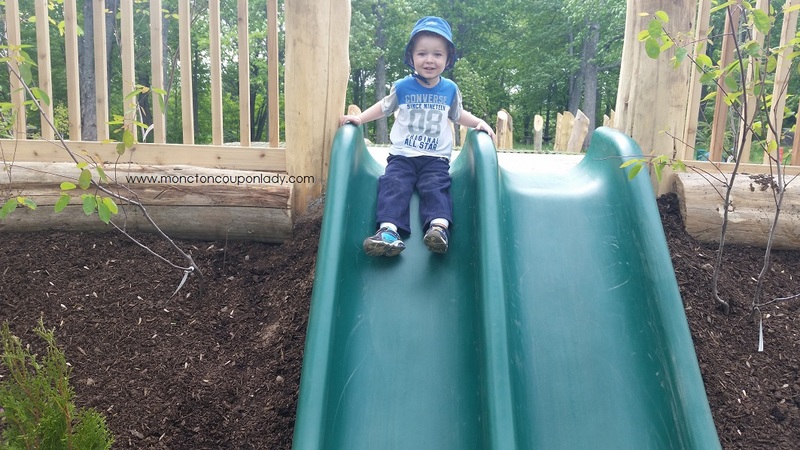 Moncton, NB has a new playground at Centennial Park. 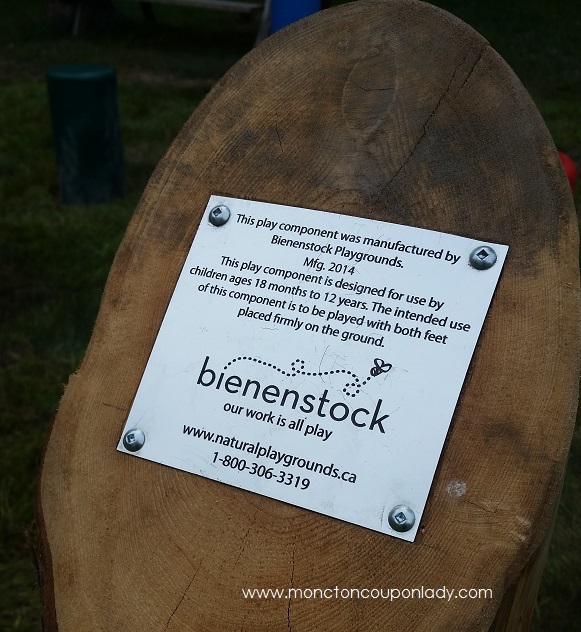 Bienenstock Natural Playground was built by employees from Tangerine Bank, the City Of Moncton and many other community members. 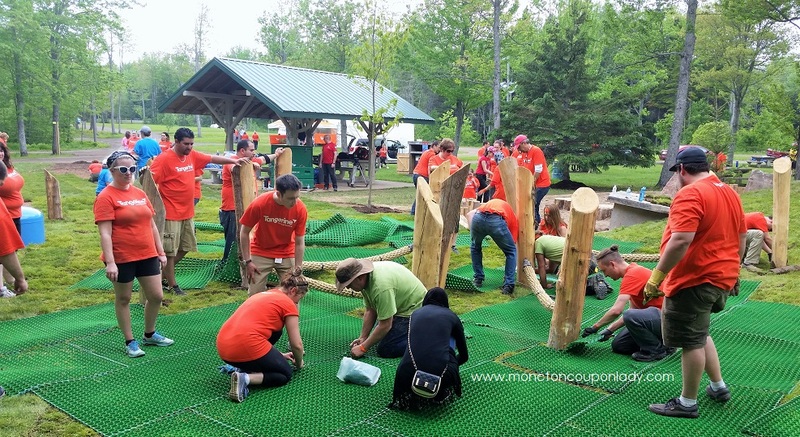 Hundreds of people joined in the Community build on June 11th, 2015. I was among the hundreds of community members who helped put the final touches on this beautiful playground. I have a brand new appreciation for what goes into a playground. 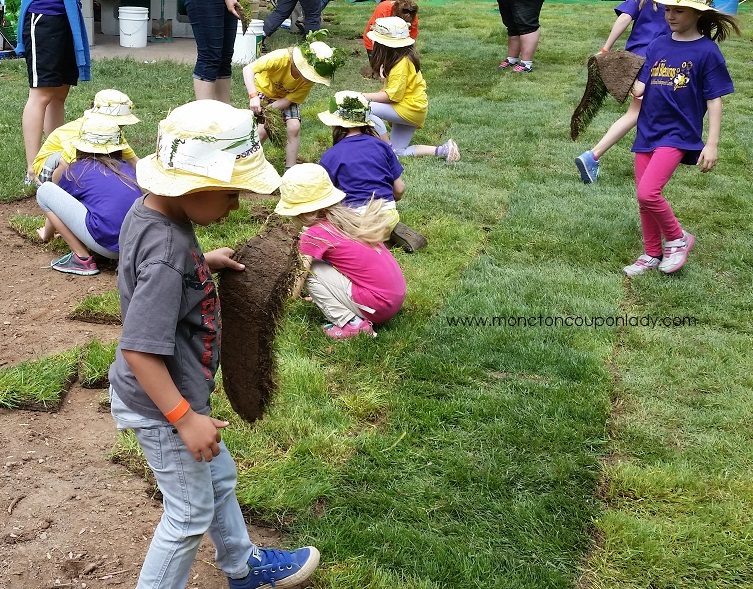 Just seeing the many layers of soil, sand, mulch and sod that go into making the ground perfect, it amazed me. This playground is designed to be used by children age 18 months to 12 years. Hard work getting the ground ready for a softer fall. 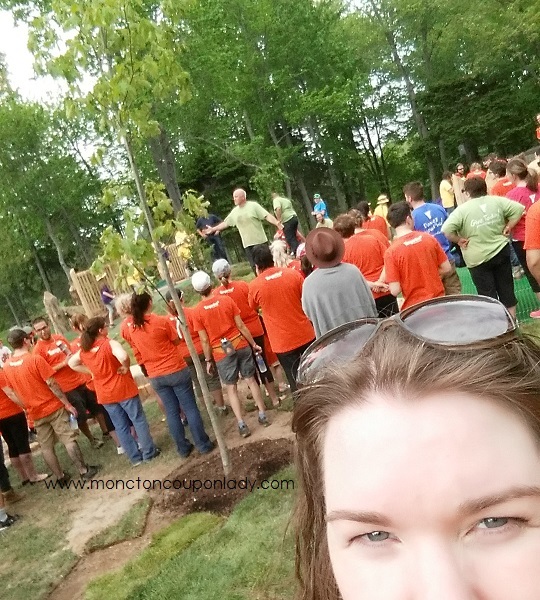 Selfie (Ruth Ann Swansburg), background is Adam thanking everyone for their hard work! 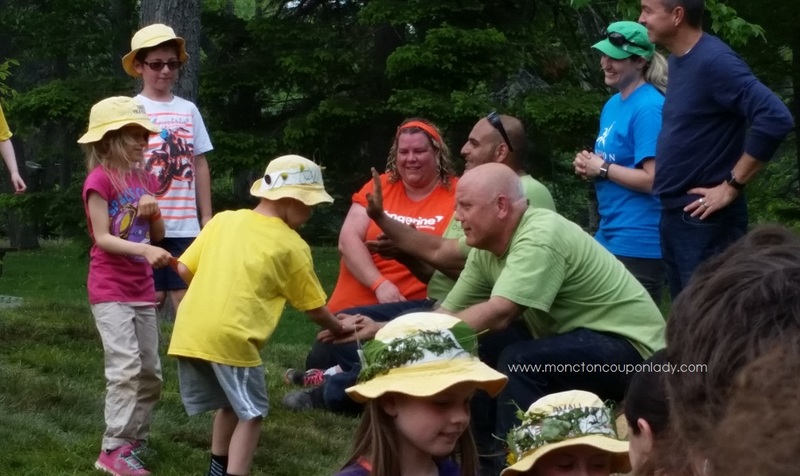 All in all the whole experience was wonderful for me, as a mom who can take my child there to enjoy it, and as a member of the Moncton community. This is the perfect new feature for the park and is situated in the middle of a large picnic area. If you want an area to take the kids, where you can let them run and climb, and not be nervous about every footstep, ladder, swing, etc…this is the playground to go to. Everything is really “safe”. No ladders to climb for the slide, just stroll up the hill! 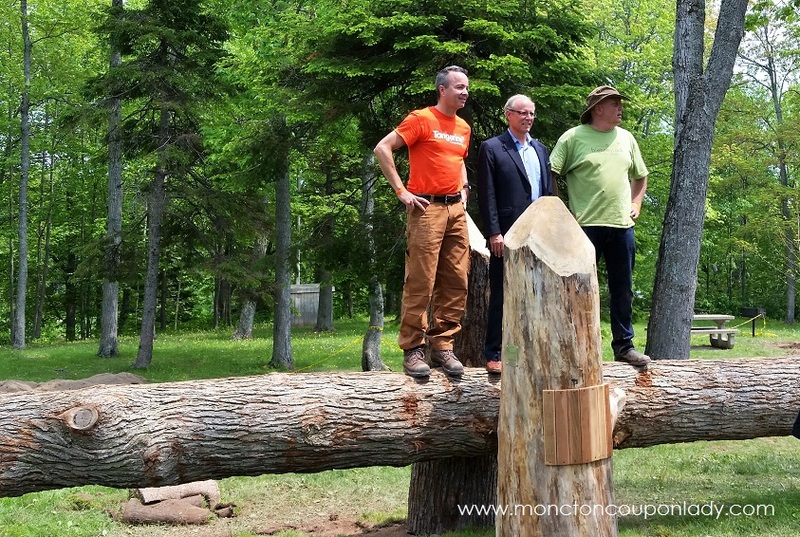 Practice your balance on the logs bordering the sanded area, or on the ropes. Bang on the drums and create your own music. Bring a book, and when the kids slow down for lunch, you can all gather on the log bench and read a book…or just rest for a few minutes. The children then had a chance to play on the slide and offered a special THANK YOU to the team who organized and all the people who came out to build this wonderful addition to Centennial Park. The following day I went back with my little boy, Clayton, 2 yrs old. Here are a few pics of him enjoying the park. Clayton enjoying the playground the next day. While we were there I spoke to a few people walking by who were amazed how fast the playground was built. Although we were alone for about an hour (we hit the parks early to get our activities in before it gets too warm), there were two daycare groups arriving as we left. 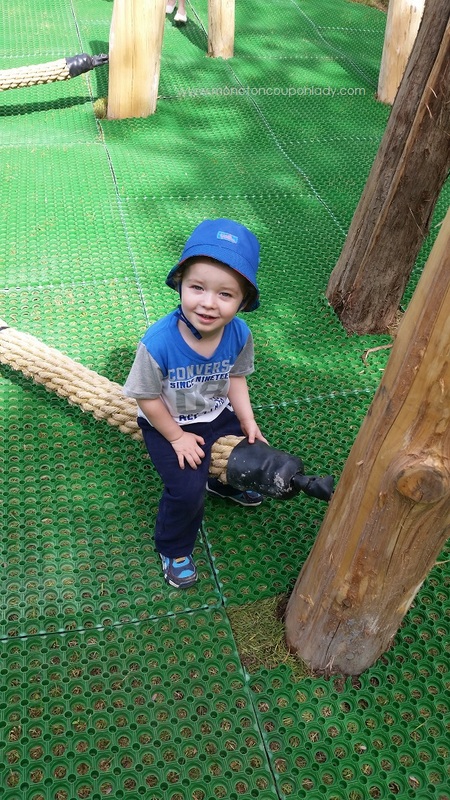 This park is a hit with my 2 year old and I know we will be spending many, many days there this summer. Awesome! Love the pictures, and so glad you got to take part Ruth Ann. I’m bummed I missed it, however, I’ll be able to say I know someone who helped build the park! Love it!